Andrew Castle thinks Andy Murray, who he describes as Britain's most eminent sportsman, is ready to win his second Wimbledon title. The Scot is now the top seed left in the draw after holder Novak Djokovic's surprise defeat by Sam Querrey. "Is it good news for Andy Murray and everyone else? Yes," former British Davis Cup player and TV commentator Castle told BBC Scotland. "Andy Murray is ready to win here. There is no question in my mind." Castle admits he himself had been criticised for being critical of Murray during his early career. "This was many years ago now, but you have to call it like you see it," he said. "I am calling it like I see it now. I think he's the most eminent sportsman that we have in this country by a distance. "Historically, when it's all said and done, he will go down as one of our greatest sportsmen." Castle believes that, if Murray can stay fit, he can add to his two Grand Slam titles - the US Open in 2012 and Wimbledon the following year. 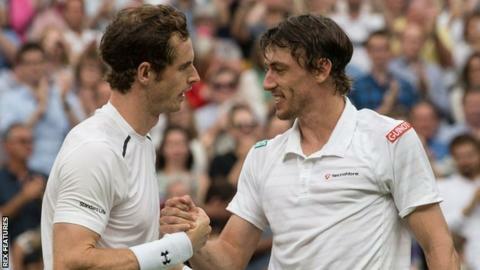 "I had him as joint favourite pretty much anyway," he said of Murray's Wimbledon chances. "It is hard to go against Novak Djokovic. When you begin a tournament, you have to go with the world number one, the winner of everything. "But there's something in Andy's demeanour and his eye and the settled nature of his life and his existence - it gives him a serenity. "To be on the receiving end of some of the shots he's hitting now, it's brutal." Lendl rejoined Murray as coach shortly before Queen's Club, where the British number one warmed up for Wimbledon with a fifth title. "He is hitting the cover off the ball, he is playing for Ivan Lendl, I can see that relationship again - it is just the best decision of all time," suggested Castle. "Whether he goes ahead and wins this or not, he's given himself the best chance. "He is a tremendous credit to himself." Murray has pointed out that Djokovic's exit means nothing to him unless he reaches the final, with the Serbian's absence opening up the other side of the draw that contains former champion Roger Federer. "You should ask Roger Federer how he feels," added Castle. "It has been a long time since Roger made a real run at one of these Grand Slams and this is his place. "For Andy, it is the next match. One of these days Nick Kyrgios is going to explode into the latter stage of a major tournament. "But, when push comes to shove, I expect Murray to come through."